Unsuspecting tourists in the popular resort city of Bali are eating dog meat advertised as chicken satay, according to a disturbing new report from the Australian Broadcasting Company. An investigation led by Animals Australia found that vendors in Bali were deceptively selling tourists dog meat, which was the product of torturing and killing dogs. 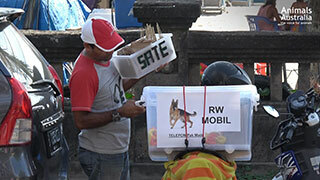 After telling an undercover investigator that the food was made from canines and not chicken, a vendor approached tourists on 66 Beach in Seminyak. “Satay just one dollar,” the vendor is heard saying on video, but when pressed about what was in the “mystery bag,” he doesn’t disclose the same information to the Australian visitors. “Satay chicken, not dog?” one tourist asked. “No, not dog,” the vendor replied. “I’m happy just as long it’s not dog,” the man said before buying and consuming the meat. “Tourists will walk down a street, they’ll see a street store selling satay but what they are not realizing is the letters RW on the store mean it is dog meat being served,” Animals Australia’s campaign director Lyn White said. The undercover investigator for Animals Australia posed as a documentary maker interested in local cuisine. The investigator witnessed dogs who were muzzled, bound by the legs with tape and stuffed into bamboo cages where they laid in their own waste. A dog catcher, who admitted to catching twelve dogs per week because he cannot find another job at age 83, bludgeons the animals to death with a metal pole. The investigator also saw other ways to kill the dogs, including shooting them, hanging them and poisoning them. While eating dog meat is not illegal in Bali, killing animals cruelly or serving meat contaminated with poison is against the law.